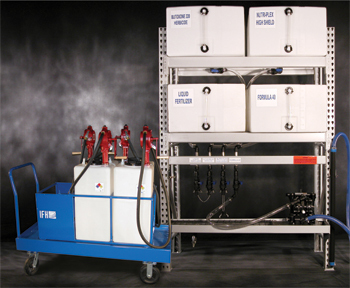 The Innovative Fluid Handling (IFH) Group, Rock Falls, IL, introduces custom storage and dispensing systems and mobile lubrication carts that use the firm’s new, lightweight and economical polyethylene containers. The storage and dispensing system proves ideal for safe and clean handling of cutting and forming lubes, hydraulic fluids and engine oils. Users can specify the number of containers and a variety of options, including pumps, hoses, nozzles and a variety of drip-pan cart bases.